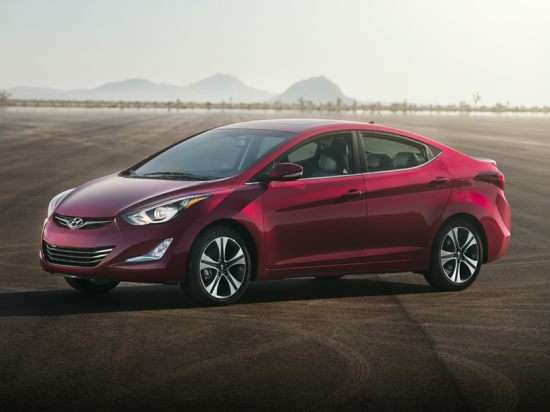 For 2014, the Hyundai Elantra continues in 2-door coupe, 5-door GT, and 4-door sedan body styles, all now equipped with side mirrors that help the driver to check the car’s blind spots. The Elantra Coupe and Elantra GT get a new, more powerful 173-horsepower engine, and the Elantra Coupe features sport-tuned steering, a sport suspension, and 17-inch aluminum wheels. These mechanical upgrades are also included for the new 2014 Elantra Sport Sedan, a new version of the car that sits between the base SE and upscale Limited trim levels. All Elantra Coupe and Elantra Sedan models, except for the base SE version, get a standard reversing camera and a 4.3-inch touchscreen audio system. The SE and Limited Sedan models get a new Driver Selectable Steering system, and all 2014 Elantra Sedan models feature subtle styling revisions. Depending on the model selected, the 2014 Elantra is offered with LED running lights and LED taillights, a navigation system with a 7-inch touchscreen, Blue Link smartphone connectivity, and Assurance Connected Care services. The 2014 Elantra Coupe and 2014 Elantra GT are offered in a single level of specification that can be upgraded with option packages and dealer-installed accessories. The 2014 Elantra Sedan is offered in SE, Sport, and Limited trim levels. Both the SE and the Limited are offered with option packages that add appealing features.